Golden Tech’s Compass HD provides durability and maneuverability at an affordable price. With strength in mind, this power chair is built with a 450 pound weight capacity and a powerful battery to take you up to 12 miles on a full charge. You can choose from four different frame color options, height, angle and length adjustable footrests, adjustable Captain’s seat and many power chair accessories to ensure this chair has everything you want and need. 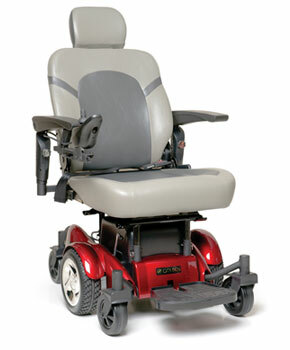 The Compass HD is a perfect choice for users needing a little extra strength while still maintaining style and comfort. The Compass HD power wheelchair, GP620, is available with different seating options to ensure that every user is comfortable and secure. Choose the standard Captain’s, optional ProFlex or optional Van/Pan Seat, for a seating style that fits their needs without compromising comfort. The standard Captain’s seat features a high back and headrest, the ProFlex seat features an adjustable angle back and push handles. Both the ProFlex and Van/Pan seat do not have seat or back cushions so that the user can have custom support, with seat and back cushions made just for their needs. Weight Capacity: 450 lbs. Overall Length: 40″ Unit Weight: 226 lbs.